This is called: Mosaic. Did you know that it goes back to more than 4,000 years? Really old! Mosaic is the art of constructing images by assembling small pieces of colored glass, stone, or other materials that are hard and known to last. These may be reflective or iridescent; they can be multidimensional, and can integrate objects and unusual items. The worth of the mosaic is evaluated taking everything into consideration: the subject matter, the style of the design, the choice and physical quality of the materials. Where does mosaic come from? Well, the earliest known mosaics consist of pieces made of diverse materials such as colored stones, shells and ivory which were found at a temple building in Mesopotamia, and go all the way back to the second half of 3rd millennium BC. Glazed tiles were found dating from around 1500 BC. Around 800 B.C., the Greeks began making pebble mosaics. The designs were initially geometric, following rug patterns. Later, they became more and more complex four hundred years later, when it became more economical to cut cubes from stone rods. The Romans were the ones to take mosaic to the next level. Complex geometric borders, war representations, tales of the Gods, and everyday life scenes were included in their designs. Mosaics were mostly found on the streets but they were also built onto walls and ceilings. 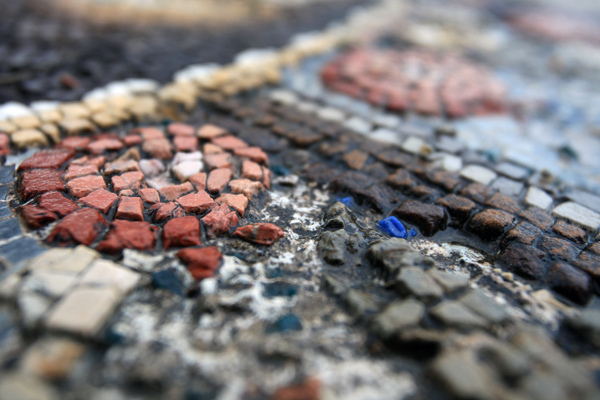 Mosaics were one of the main forms of expression in ancient times. They were appreciated for their functional yet decorative feature. They could be found almost everywhere in the Middle East and the Mediterranean and were considered prominent assets by their proprietors. By 480 A.D, subjects turned religious and stone as a material was replaced by gold and glass. After the fall of Byzantium in the 15th century, mosaics went into decline to be revived in the 19th century with new techniques to mass produce tiles. A new movement took on the revival of mosaic: Art Nouveau. Nowadays, mosaics are primarily constructed from ceramic tile and glass but artists are giving it a new twist using different materials. One of the main advantages they have is access to a wide modern audience. Mosaic being appreciated and permanent survived for thousands of years and still has a wide base of enthusiasts. It’s a timeless art. Where have you seen mosaics lately?